today is a dreary, rainy day, and i didn't feel like doing anything. so, i decided to get out my biggest canvas to love on. i got some tunes going, lit some incense, and splattered paint while dancing my hands over that previously loved canvas. it was joyous and carefree like i was with a lover. i didn't care the outcome, i was inspired! it was glorious! the colors moved under my hands perfectly, in harmony with my feelings. i fell in love with how it was taking form. 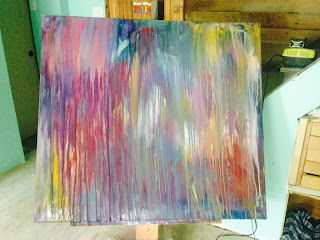 i gave it a few mists of water to get the paint flowing down the canvas and fell in love all over again! and then i saw it. the old painting coming thru. i didn't cover it with gesso because i loved the colors of the old painting and wanted hints of it, if hints did happen. what i did NOT want was for the whole painting to come out, my paint choices falling to the floor! 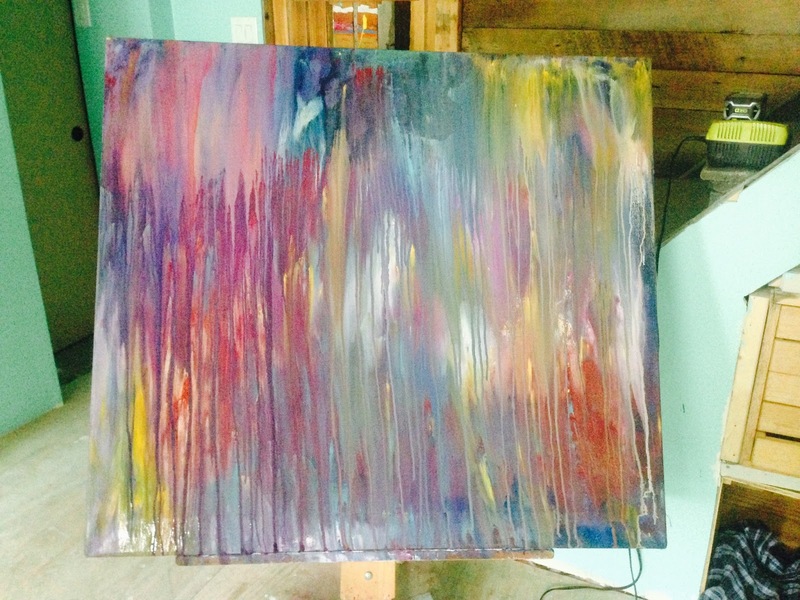 and as i watched, more of my paint melted away, and more of the old painting was left. i wrung my hands, the paint still clinging to them, crying inwardly over the slow death of what was to be a beautiful canvas of my doing. as i am writing this, the canvas rests flat on the floor in hopes that it dries onto the canvas at some point, but my fear is that the old paint and the new paint are not compatible. what may have been another factor in this learning experience is that it is already a wet day, and with the water i sprayed it might have been just too much for the paint to stick properly. it was already wet enough, i should have let the paint rest a little before attempting to spray it for the drips i wanted to happen. it is a fine line when you want your paint to drip. i have had paint completely dry up on me before i grabbed the spray bottle, so i have learned to go quickly if i want drips to happen. now i know to judge the weather for moisture to gauge the dry time before spraying. todays lesson was a rough one since i loved the process as well as the potential outcome, but i'm glad the process was enjoyable at least! and, it is New England, tomorrows lesson may be to hurry to give it a good spray before the paint dries up! the canvas that was a bust... wasn't!